On hot summer days, we all tend to overuse our air-conditioning units. At the same time, we overuse energy and overpay on our energy bills. Lots of methods exist to lower the usage of air-conditioning, while still remaining comfortably cool inside the confines of our homes. Try some of these tricks in your home, and see if it doesn’t make a difference on your next energy bill! Turn on your ceiling fans. Though this piece of advice may get overstated, it’s because it’s the best advice for lowering your energy usage! Fans make the temperature seem 10 degrees cooler, while using significantly less energy. While fans are blowing, thermostats can be turned down. Make sure your ceiling fan is turning in the right direction. If you switched the direction for winter, switch it back by slowly turning the blades in the opposite direction. For most fans, the blades should be turning counterclockwise for summer. 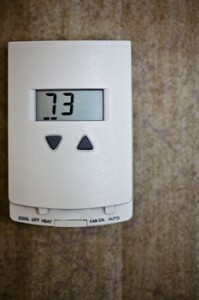 Install a programmable thermostat to a central air-conditioning unit. This allows you to turn up the temperature while you’re away, and turn it back in an hour before you come home. You’ll never know the difference! If you have window units, just purchase a general plug-in timer. Clean or replace the air filters every month. This helps with efficiency, which then uses less energy. Use chemical washes on cooling coils and blower blades, to prevent mold buildup. Choose washes that don’t contain harmful VOCs, like caustic-hydroxide pducts. Close the vents and doors in rooms that aren’t often used, or in bathrooms where you enjoy hot showers. The less amount of space the unit needs to cool, the less it will run. Don’t close too many vents at a time, however, or the pressure could cause leaks in the air ducts. Don’t place anything that releases heat near the air-conditioning thermostat, such as appliances, lamps or electronic devices. The thermostat will think the temperature is much higher than it really is. Close the blinds on your windows when the sun is blaring directly inside. A task as little as this can save 40 percent of the sun’s rays from heating your interior. Plant trees in front of where the unit resides outside. Foliage blocks the sun’s rays, while still allowing air flow. A shaded unit uses less energy. If nothing seems to lower your bills, it might be your time to purchase a whole new unit. New units use 30 to 50 percent less energy than units that are more than 15 years old. The initial cost will save you in the end.